Show off your personal style with Knitted Jackets, a folk-inspired collection of fun-to-knit wearable knitted jackets from knitwear designer Cheryl Oberle. Knitted Jackets: 20 Designs from Classic to Contemporary is an inspiring collection of 20 step-by-step designs for creating wearable jackets varying from long to short, close to loose-fitting, and every design features gorgeous colors and textures. The structure of these jackets is, for the most part, simple; there is no elaborate shaping and most are designed to have a minimum number of seams, allowing them to be "knitted together" rather than sewn. 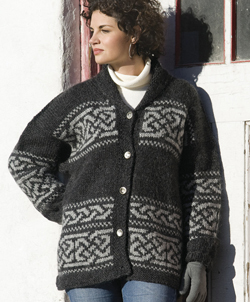 "These figure-flattering designs bring a contemporary edge to a variety of knitting traditions. Simple, classic lines provide a nice backdrop for a variety of techniques." Learn from Clear, Straight-forward Instruction. In addition to clear patterns and step-by-step instructions, each of the 20 patterns in Knitted Jackets has detailed yarn information accompanied by the Craft Yarn Council's standard weight symbol. A dedicated chapter on Materials and Techniques makes yarn substitutions easy. Knitwear Designer Cheryl Oberle has divided her book into three main sections, each with a selection of fabulous designs that can be worn every day.